Bill is the CTO of Dell EMC’s Big Data and IOT Consulting Practice. He is also an Executive Fellow at the University of San Francisco School of Management. Bill has over three decades of experience in data warehousing, BI and analytics. He is currently serving on the City of San Jose’s Technology Innovation Board as well as on the faculties of The Data Warehouse Institute and Strata. Previously, Bill was the vice president of Advertiser Analytics at Yahoo, responsible for the development of Yahoo’s Advertiser and Website analytics products. Before that, he ran the Analytic Applications business unit at Business Objects. Not sure I consider myself an expert as much as I am a person with a passion for data and analytics. My love of numbers really started when I was a youngster and was fascinated by the Strat-O-Matic baseball game. Through college (I was Coe College’s second computer science graduate) and through out my career, I continued to look for opportunities to immerse myself into data and analytics. And it all came together in 1984 when I joined Metaphor Computers – the industry’s first Decision Support System. It was from working with insightful clients like Procter & Gamble, Coors, JD Searle, Helene Curtis and others that I become addicted to helping organizations uncover customer, product and operational insights that they could use to optimize key business processes and uncover new monetization opportunities. Tom Davenport was one of my early influencers. I love that he’s always tying analytics back to the problem at hand. He’s very focused on making the analytics actionable. And the book (not the movie) “Moneyball” really cemented my analytics passion. As I mentioned early, I was fascinated with numbers in the world of baseball, and I felt like that book really spoke to me. Stephen Covey and his book “The 7 Habits of Highly Effective People” was very instrumental in my approach to data and analytics such as Begin with an End In Mind. All of his 7 habits are relevant to anyone interested in deriving and driving business value out of data and analytics. Michael Porter was the impetus for my Big Data MBA books and the class that I teach at the University of San Francisco. And of course, Peter Drucker. WHICH BRANDS OR PRODUCTS STAND OUT FOR YOU IN BIG DATA? I love what Google is doing in making machine learning and artificial intelligence tools and training more widely available. I also have a great deal of respect for Andrew Ng and DeepLearning.ai. Plus there is a bounty of marvelous training and educational material that’s freely available on the Internet from some incredible thinkers that I’m fortunate to converse with over social media (yea, there is some good that comes out of social media). Anything associated with education. I feel like I’m on a mission to help tomorrow’s business leaders embrace analytics as a business discipline. That analytics is a tool for doing so much good like improving safety, improving quality of care, improving educational effectiveness, improving environmental sustainability, improving quality of life, etc. In a world with some many problems, analytics has a lot to offer in helping to address those problems. LinkedIn or Twitter. 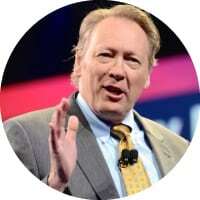 Or reach to me directly at william.schmarzo@dell.com.